I’ve eaten stacks of pancakes with bacon on the side for years . . . boring. 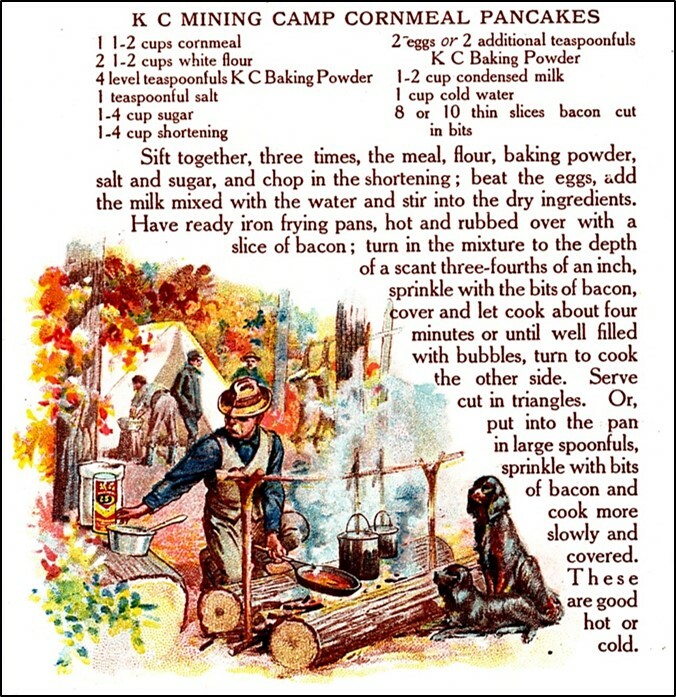 So I was thrilled to find a hundred-year-old recipe for Mining Camp Cornmeal Pancakes. 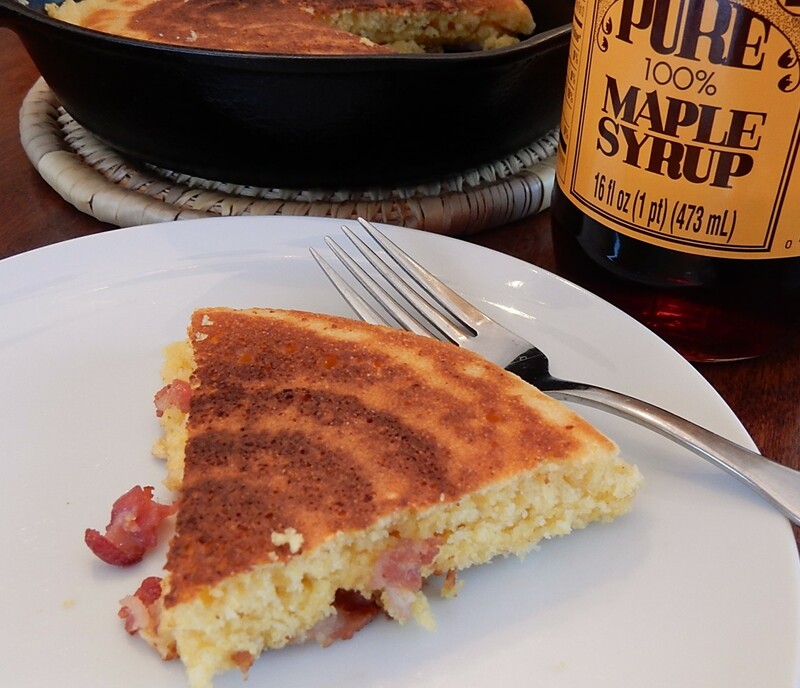 The hearty giant pancakes embedded with bits of bacon are cooked in a skillet, and are cut into triangles to serve. The pancakes were a delightful taste treat that took me back in time to the days of hungry hard-working gold and silver miners in remote locations. The old recipe also indicated that, if preferred, smaller, more typically-sized pancakes could be cooked on a griddle. Put the bacon pieces in a skillet, and cook over medium heat until the bacon just begins to crisp; stir occasionally while cooking. Remove from heat and set aside. Reserve a small amount of the bacon fat to grease skillet. In the meantime, put cornmeal, flour, baking powder, sugar, shortening, eggs, and milk in a mixing bowl; beat until combined. 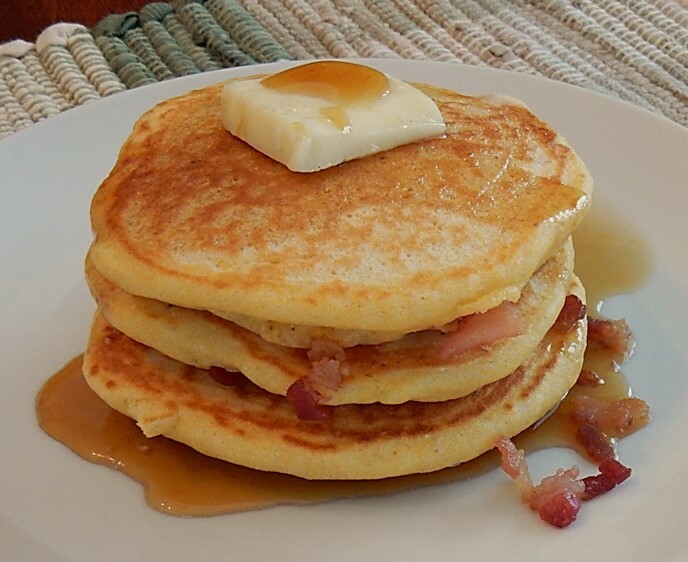 Option 1 – Large Pancakes that are Cut into Triangles: Generously grease a skillet with bacon fat. (I used a 6 inch, cast iron skillet). Heat skillet until hot using medium heat, then spoon 3/4 inch of the batter into the pan, sprinkle with the cooked bits of bacon. Reduce heat to medium low, cover and cook for about 3-4 minutes or until the batter is bubbly; then turn the pancake over and cook the other side. Remove from heat, and cut into triangles. Cook additional pancakes until all the batter is used. Option 2 – Regular-sized (3 – 4 inch) Pancakes: Heat a greased griddle until hot; then spoon or pour approximately 1/4 cup batter onto griddle for each pancake. Sprinkle bits of cooked bacon on the top of each pancake. Cook until the batter is bubbly, then flip pancake and cook the other side. I made several ingredient adjustments when I made this recipe. The old recipe called for 1 teaspoon salt. I didn’t use any since the bacon was salty. The old recipe also called for the use of condensed milk and water. In the mining camp far from town, it made sense to use canned condensed milk – but since I had regular milk in my refrigerator, I used substituted it for the condensed milk and water. Additionally, the batter seemed very thick, so I used a little more milk than the combined amount of condensed milk and water called for in the old recipe. Posted on February 18, 2018 February 16, 2018 by SherylPosted in FoodTagged pancakes, recipe. I like the way you managed the substitutions. It’s nice to hear that you liked how I handled substitutions. I often struggle with how closely I should follow the original recipe. It’s wonderful to hear that you liked them. I also loved the illustration in the old cookbook. It enabled me to more clearly imagine what life would have been like in mining camps where miners may have eaten pancakes like these. A regular pancake is 3″-4″? That made me laugh. Beyond that, your photos look so good I had to take some time out for breakfast. It’s interesting how many old recipes call for far more salt than I’d use today. Clearly, tastes have changed, for a variety of reasons. One thing that I’ve learned over the years from making these old recipes is that if it seems like a recipe calls for too much salt, reduce the amount. When I first starting posting these recipes, I sometimes followed the recipe to a “t” even if it seemed like it called for a large amount of salt – and inevitably I didn’t care for what I’d made. They look great. I enjoy a hardy breakfast. Those look wonderful. I am going to make these. Thanks for sharing. You’re welcome. This recipe is yummy. I would love some NOW. hmm. . . I don’t think that I’ve ever eaten cold pancakes, but these probably would be food. I think that you’ll both enjoy this recipe. A good find, looks hearty and the pictures are great! They are good. It’s wonderful to hear that you liked the pictures. I often struggle to get photos that satisfy me.